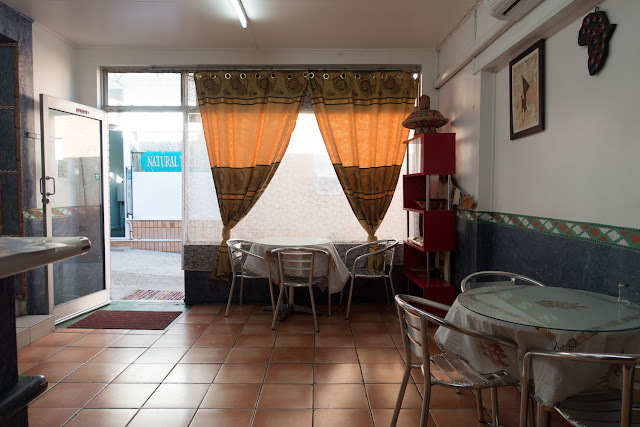 We heard on the food-nerd grapevine that Marooka in Brisbane is worth checking out. So we did. Marooka's strip of shops is about a ten minute waddle from the train station through car yards and deep suburbia. There's maybe half a dozen North African joints we'd love to try, unfortunately we've only got time for one. 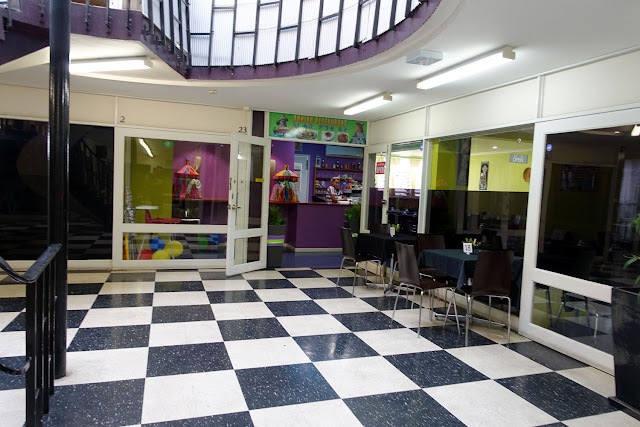 Some of the restos are hidden in Marooka's nooks and crannies, like this hella-groovy 1960s era shopping arcade. 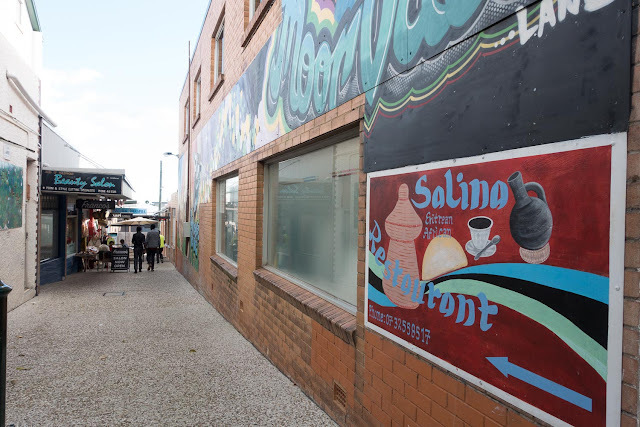 Our eyes light up when we see the sign for Salina Eritrean Restaurant down this little alley, nothing excites us more than an untried cuisine. The place is hole-in-the-wall perfect. There's a bunch of customers out of shot, it's the most happening joint in Marooka at 3pm on a Monday. It's an order-at-the-counter job. We ask for a couple of dishes but the super nice boss lady reckons we only need one between the two of us. 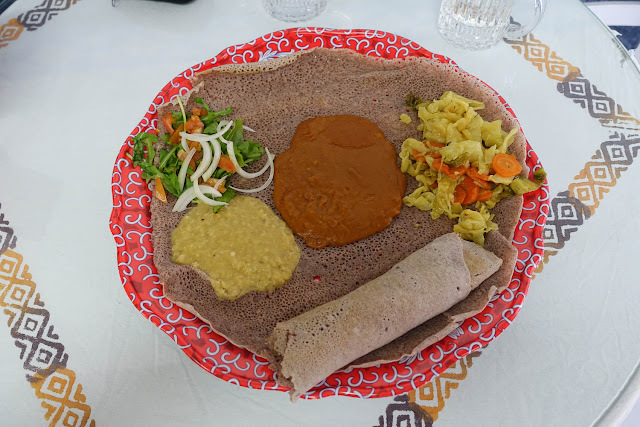 We go the Green Vegetable: a couple of bits of injera - light soft spongy bread with a mild fermenty flavour, topped with a simple-yet-wow curry/stir fry of cabbage and carrot, a little salad, shiro (brown goo) and split peas (yellow goo) which google suggests is kik alicha, which tastes like a sharp, garlic-y dahl. It's a bit amazing. Shawn can't remember what the Shiro tasted like, apart from brown, maybe Alison will fill in the dots later. Edit: Alison does remember, it was a ginger and warm spice with a slight chilli kick. And very brown. Lunch is twelve bucks and fills two big eaters. It's so good we feel guilty. Another diner says the food tastes just like Africa. "I cooked it" beams the boss lady. Sydney-siders can get similar kicks at the popular Aaboll Cafe in Merrylands, in Melbourne we'd be sniffing around Footscray. Salina Restaurant menu - click to enlarge. 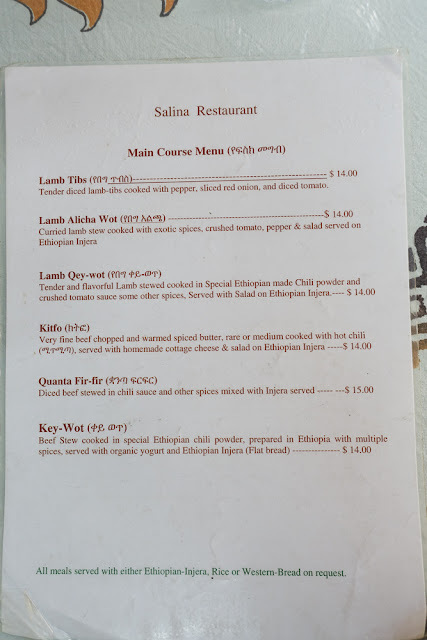 Salina Restaurant menu - click to enlarge. In hindsight we should have got some extra dishes to takeaway. Doh! Salina Eritrean Restaurant is at Shop 8, 173 Beaudesert Road, Moorooka. 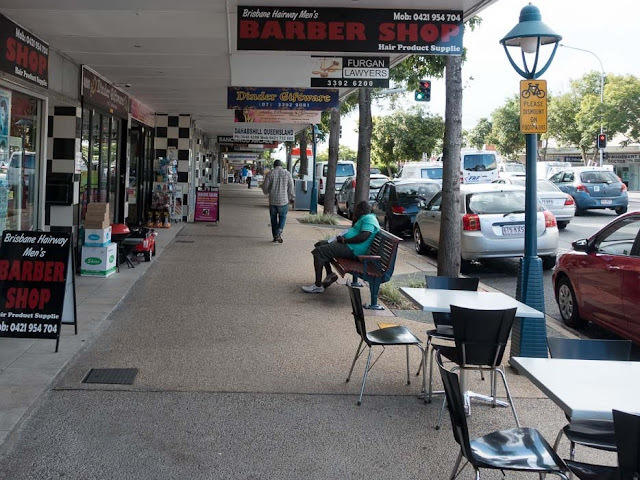 There must be 70 or 80 restaurants in Sunnybank (chinese, Taiwanese, Korean, Japanese, Vietnamese, Singaporean, Malay, Indonesian, Thai). 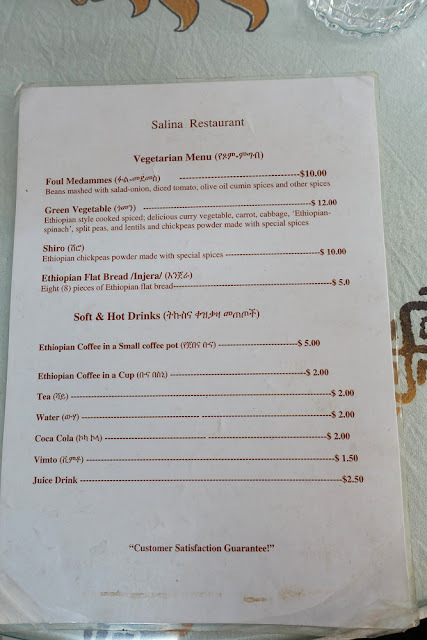 There are also some other hidden gems in Brisbane, Inala (Vietnamese 20 or places), Mooroka (a strip of African restaurants, Ethiopian mostly but also Eritrean and Sudanese), Upper Mt Gravatt (lots of Indian street food, best ever biriyani, Pakistani, Lebanese, Korean) Runcorn (20- 30 places mostly Korea, Taiwanese, Chinese), Woodridge (has a huge veg market every Sunday in one of the world's most ethnically diverse areas - lots of authentic street Thai, Laos, Malay, Viet, Samoan, Maori/Kiwi, African BBQ, Filipino) around Logan area (Turkish, Afghani, Polynesian, Indian Street, Lebanese breads, Pakistani plus more). All in old strip malls in outer suburbs, all cheap! Great blog - I scope it now and then to see what's good in Sydney! Next time i'm in Brisbane I'd like to visit the Woodbridge food market, sounds amazing. 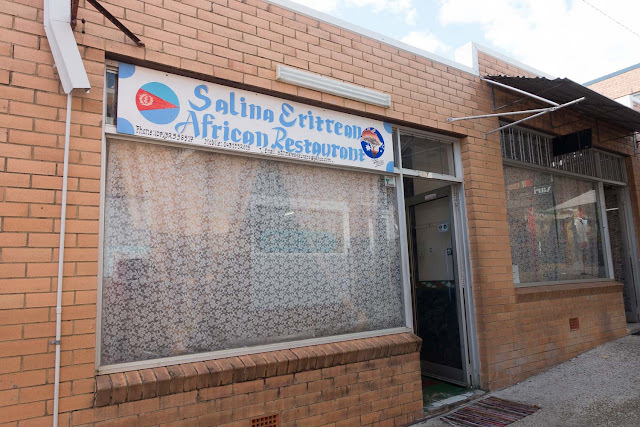 As far as east African food, there's places all over Melbourne these days, but Footscray's still the hub - maybe 20 or so restaurants in a few blocks! Never understood why there's so little in Sydney? But you should check 2 places in Bankstown - El Shaddai which is a west African joint with food from Sierra Leone and a new place called Kings and Queens which is run by Nigerians, i'll be heading out west next time i'm in Sydney! Thanks so much for these excellent suggestions. We've been to Footscray and had some great African food there, and wondered exactly the same thing about Sydney. You've also given us some great tips, we will be checking them out.